Clutter: why we have it, what it does to us and how to climb out from under its heavy burden. 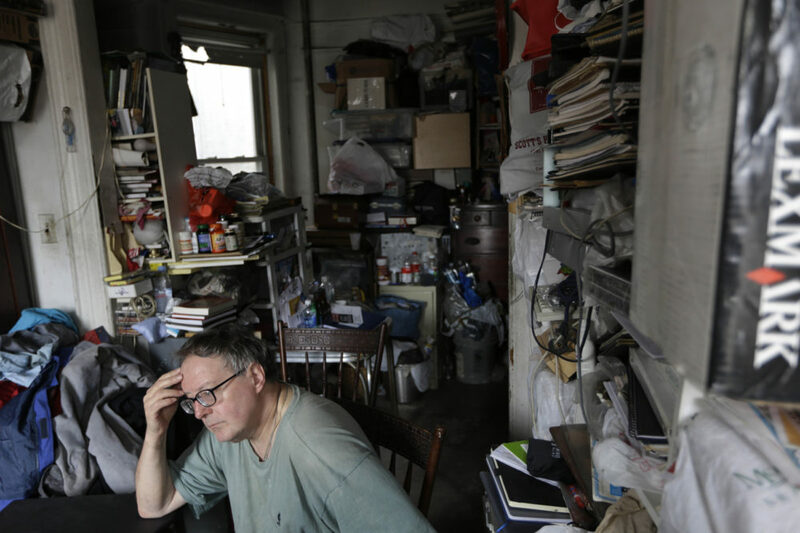 Joseph Ferrari, professor of psychology at DePaul University (@DePaulU), where he’s studied the causes of clutter and its impact on emotional well-being. Author of "Still Procrastinating: The No-Regrets Guide to Getting it Done." Washington Post: "Five Spaces That Would Make Your House Much Easier For Your Family To Live In" — "Exchange room: One issue I notice in almost every home is boxes or bags lined up in a front hall, dining room or bedroom that are waiting to be taken somewhere — to school, to the office, to the post office, to a thrift shop, to return to a store. This is modern life. In decades past, packages weren’t arriving daily, people weren’t working from home and from an office, parents weren’t asked to bring items to school each month, and kids didn’t participate in as many extracurricular activities. Everything that needs to be remembered for an event, returned to a store or sent back to an online retailer is put somewhere in the house where it will be seen and remembered, which often means it’s somewhere you really don’t want it to be. "Wouldn’t it be easier — and tidier — if all of those items were kept in a space designed to accommodate them — an “exchange” room? It wouldn’t require a lot of space, but could have shelves or cubbies designated for incoming and outgoing items, and space for packing and mailing supplies, as well as spare bags and boxes. Sort of a mailroom for your house. "Space for recycling: As long as we’re talking about items going in and out, let’s discuss all those bottles of sparkling water, wine, soda and juice you bring into your house each week. Not to mention the food containers and never-ending catalogues and junk mail. It’s good news that so many items are more environmentally packaged, but most houses don’t have the space to keep up with the flow. Either the indoor recycling bin has to be emptied daily, or items pile up next to the bin. Neither option is optimal, and neither encourages recycling. A household with more than two people needs more than one standard 13-gallon recycling bin. Optimally, there would be space for at least three bins somewhere near the kitchen or a large cabinet that could hold several rectangular bins that could be easily slid in and out." New York Times: "Super-Sorter Marie Kondo Now Has a Reality Show" — "Entropy, that unpleasant byproduct of consumerism, has been a subject of reality TV almost since that genre’s genesis. From 'Clean House to 'Hoarding: Buried Alive,' we’ve seen how pathological our relationship to stuff can be, and how powerless so many of us are to dig out from under it all. The home purge show is now as rigorously structured as the hero’s journey or a Petrarchan sonnet. In it we see the act of decluttering as a quest, and the tidied home as a proxy for our reborn selves. "It’s a form wonderfully suited to the animistic methods of Marie Kondo, the Japanese tidying guru who taught the world to kiss its socks goodbye with a novel organizing principle: If your belongings don’t spark joy, thank them for their service and show them the door. "Her first book, 'The Life-Changing Magic of Tidying up,' published in the U.S. in 2014, made her a superstar — maybe the world’s first decluttering celebrity — and a publishing behemoth; it is still a best-seller, with over 8.5 million copies sold in over 40 languages. Her third and latest book, 'Joy at Work: The Career-Changing Magic of Tidying Up,' written with Scott Sonenshein, a professor of management at Rice University School of Business, out in spring 2020, was bought at a competitive auction for seven figures by Little, Brown, said her American agent, Neil Gudovitz. (The executives at that publishing house seem to have been inspired enough by her tenets to name an imprint for them, though it was created before this last acquisition: Little, Brown Spark will print 'Joy at Work,' and other health and lifestyle titles.)" Psychology Today: "Why Your Clutter Is Killing You and What to Do About It" — "
Whether you're a clutterbug, packrat, or have a full blown Hoarding Disorder, your collection of stuff could be amping up your nervous system and keeping you in a constant state of stress. And I need not tell you about the physically and mentally corrosive effects of chronic stress, right? Even if you convince yourself that your clutter (more often unsightly mounds, piles, boxes and bags of junk) is personally harmless, usually a clutterer's spouse and other family members suffer the ill effects of disarray, disorganization, and mess. In fact, sadly, I have seen basically good marriages implode under the emotionally crushing weight of unmanageable amounts of unnecessary stuff. Consider the parallel of an unpleasant drone. If the disagreeable noise is mostly steady, people usually adapt to it and it doesn't always bother them on a conscious level. But when the steady, noxious sound suddenly stops (e.g., the refrigerator compressor turns off, the HVAC system cycles off, or the sound of lawn care equipment ceases), a palpable sense of relief, peace and quiet is dramatically experienced. Similarly, people become revved up by and inured to visual chaos, too. And when people are in aesthetically pleasing, organized and uncluttered surroundings, they also feel more relaxed, at peace and calmer. This program aired on January 10, 2019.